Now the exciting part of putting together a portfolio. To make sure we are on the same page, I am going to assume you've covered the previous tutorials because it really matters. If you skipped some, check back on the previous tutorials because there is a lot of information in this one. There are 2 types of portfolios I'll be going through. If you are in between, apply the same principles from both. There are also two ways of doing it here. 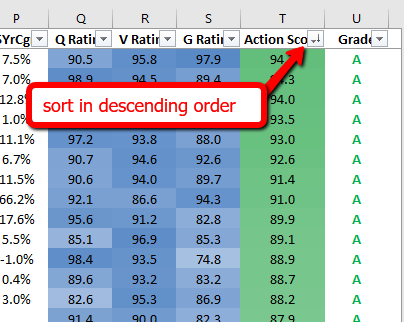 Go to menu > download area > download the daily Action Score Database spreadsheet. Open the spreadsheet and select the first tab. We'll eliminate OTC stocks and only select USA companies. Scroll to the right and sort the Action Score in descending order. According to the backtest, you can take the top 20. HOWEVER, my recommendation is to filter it some more. If you see the image below, there is a lot of retail stocks making up the list. You don't want to buy 20 stocks where 10 of them are retail. 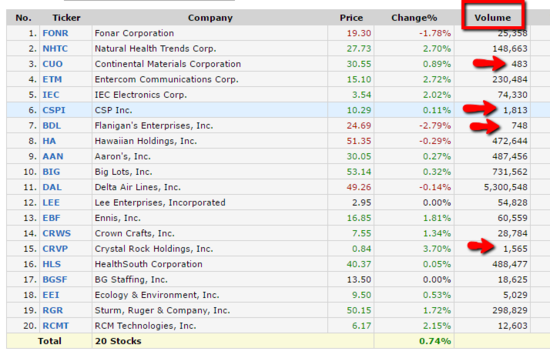 To diversify and spread your bets, my rule of thumb is to limit holdings to 2 or a max of 3 from the same industry. I've highlighted in orange the retail stocks. For this example, if I wanted to only buy 2 retail stocks and decided to select BIG and AAN, my potential portfolio would now look like this. Because there will be stocks that you can't purchase due to liquidity, you will continue moving down the list. 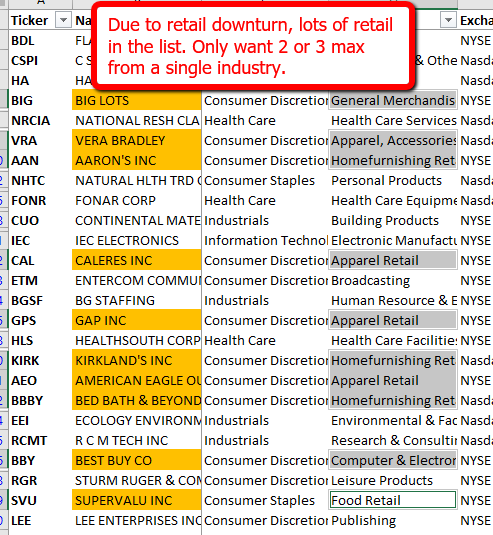 If more retail stocks appear, apply the same method to remove them from the list. I removed NRCIA from the list because I discovered too many corporate actions with the company. It will look like this when done. The arrows show that 4 stocks have low volume and you have to be patient to buy the full position. OR if you can't buy it without chasing, move down the list and get the next one to replace it. The part 1 version of portfolio construction used the entire universe of stocks. My personal preference is to further refund certain sectors and industries. We backtested what we call our "filtered universe" by removing OTC, financials, banks, miners and utilities. That's what I will stick with. 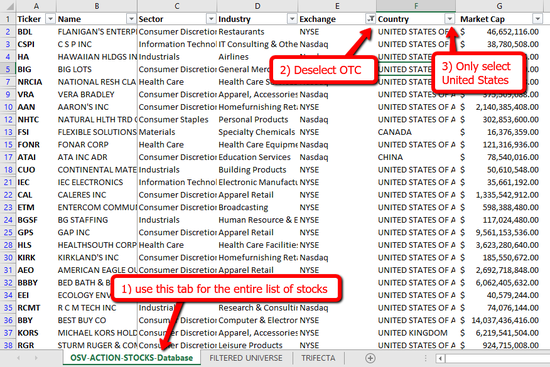 Apply the same filtering process as we did in the Part 1 version to remove retail stocks. Tomorrow it may be the healthcare industry that makes up the bulk of the list. Whatever it is, don't focus too much on a single industry. 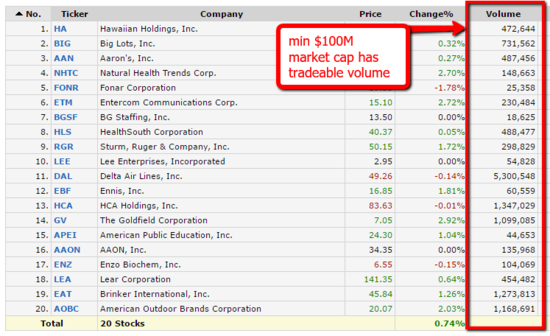 For this example, I've filtered market cap to be greater than $100M. The final list looks like this. You should be able to buy any of these companies through a good broker. 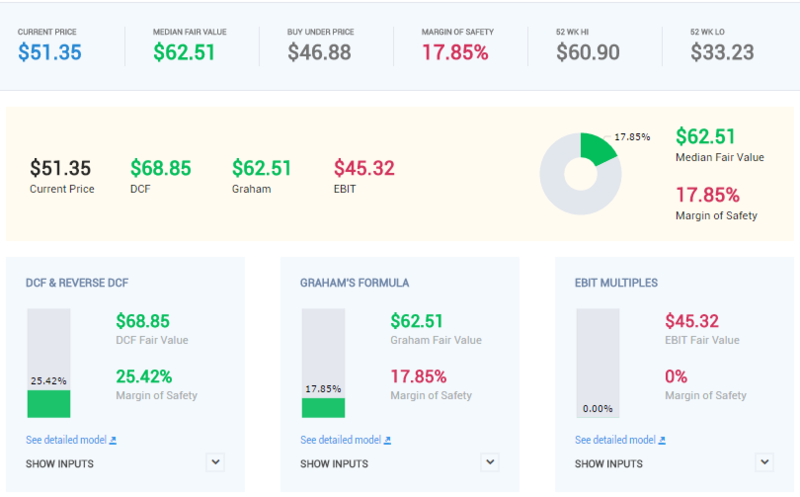 To reduce trading fees, see if your broker supports trading in baskets. 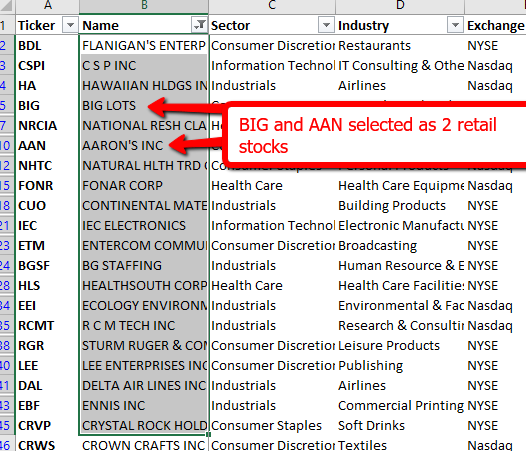 Hopefully you can save lots in fees by selecting 20 stocks and buying them all in a single transaction. I use interactive brokers which is very low cost. Costs about $1 for a trade. Not the easiest interface to get used to, but their trade executions are very fast compared to the cheap brokers where you'll end up paying more for the stock. The same steps apply up to creating a highly filtered list. Where the Active Investor's portfolio will differ is the manual valuation of stock. 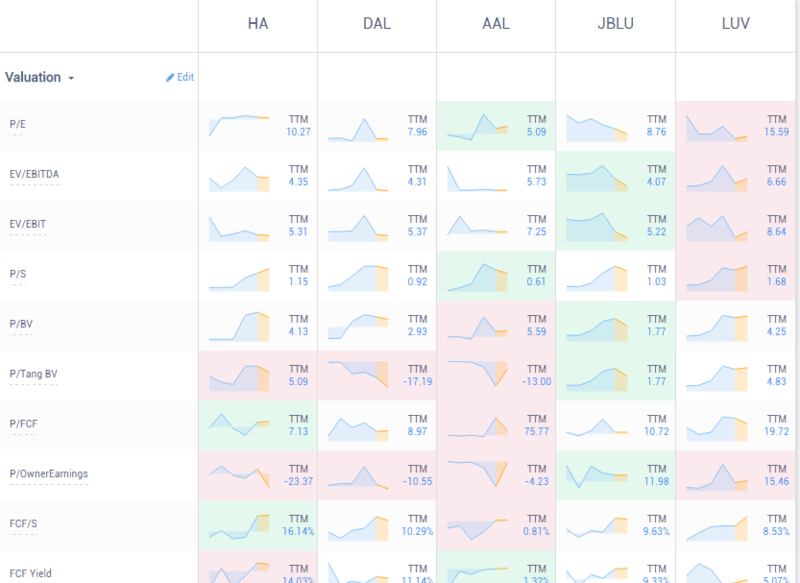 The top 20 stocks will be based on stocks that have a more traditional margin of safety. Many stocks in the top 20, won't be attractive to pure value investors because there are many good companies trading at fair prices. 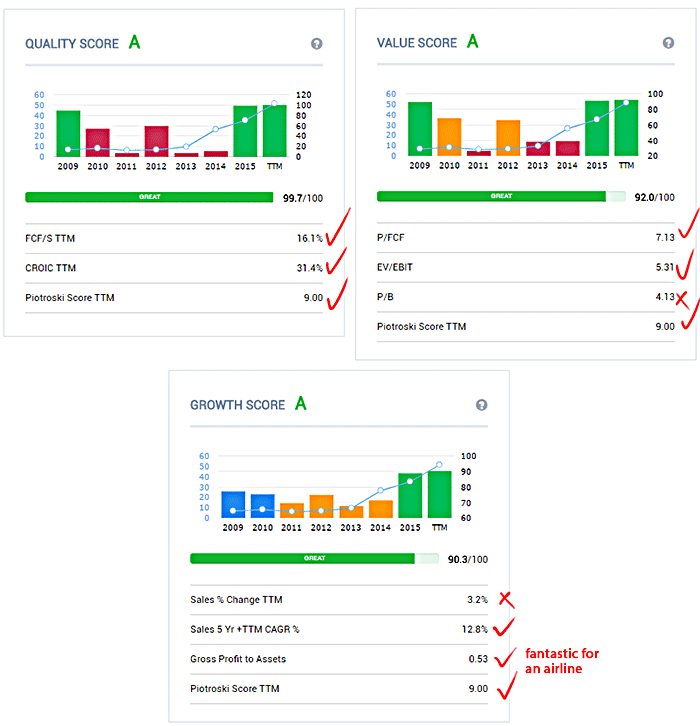 The Old School Value Action Score isn't about buying cigar butts or cheap junk. 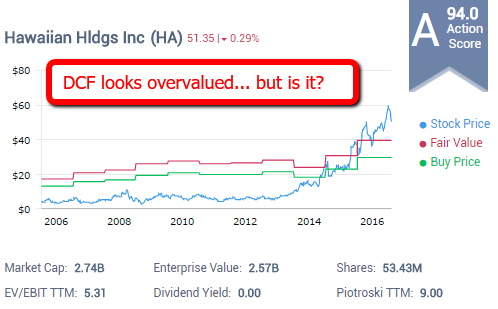 Many great investors include Howard Mark's and Be Graham has said that a price low enough can make even the worst stock act like an "AAA". 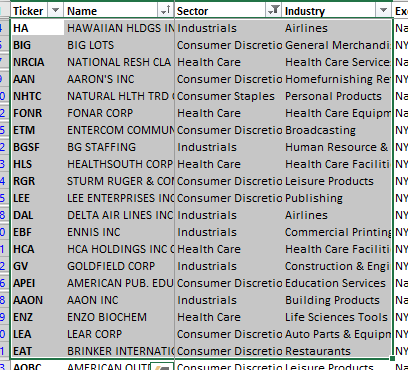 Getting back to the portfolio, number 1 in the filtered list is Hawaiian Holdings (HA). Looks overvalued, but keep going. Don't dismiss it. Verify to make sure. If you ignore the stock price and look at the current stats of the company, numbers are amazing on all levels. To look up why the DCF is low when these numbers say it is undervalued, I'm checking some to go to financials and see how the past 3-5 years of operating income, FCF and Owner Earnings has been. Operating at exceptional levels for an airline. Shares outstanding is down again. Nice. Look at that massive reduction in capex. Management is rocking it at HA. 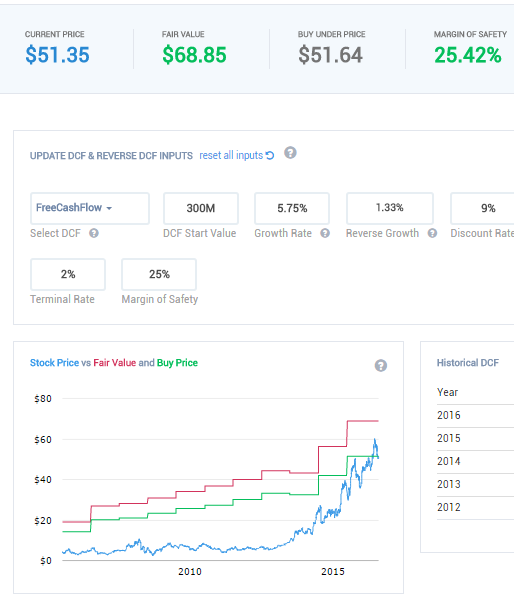 If I then update the DCF to use FCF, starting value of $300M and growth rate of 5.75%, the fair value comes out to around $68. This will be a "normal case". The MOS sensitivity table shows the bottom and upper range of the valuation - because valuation is a moving target and never an absolute value. If you use a 9% discount rate, growth has to be negative for the current price to be overvalued. When it's all said and done, my quick valuation comes out like this. The total margin of safety is not huge. And you could wait for HA to come down to at least 25% before buying. Now I'd want to compare against competitors to see where it matches up. You'll see that HA is not the cheapest, or the most expensive. A 17.85% margin of safety also suggests the same thing. I'll leave the final decision up to you, but I hope you can see how to work through a stock once you've got your list. The left sidebar is divided into 4 sections and labeled for a reason. It's to remind you of the process and to help you go through each step one at a time. There's a lot to know and remember. If you are following along and feel yourself getting up to speed - well done. If you feel like you're drinking from a fire hose, make sure to save the emails and follow along at your own page. You can also reference these tutorials again in our knowledgebase. I wish like everyone else that there was a super simple way to make money. The reality is, there's always some work involved. The process I use with the QVG method is to make it easier, but for greater returns and to help you protect your portfolio (or emotions) from volatility, remember the rules of thumbs. spread your bets with at least 20 stocks. Can be 25 or more. There's still more to come, but the real meat of the process is this tutorial - how to create your top 20 portfolio.